The question that we are frequently stormed with is “Who is Digital Marketing for?” Well, the answer is “For most of you!”. Digital Marketing can be seen as a stream which graduates actively searching for jobs can take up. Even sales professionals looking for office jobs can take up digital marketing to switch to a business development office role. Digital Marketing also helps people improve the way their business is done. It also gives them the chance of being a freelancing digital marketing professional. Final year students would be looking to start their professional work pretty soon. Companies usually prefer students who have done certification courses that are out of the academic syllabus. Since Digital Marketing is in a boom currently with many companies migrating to digital marketing services, you will find this very useful. Picking up the right digital marketing training will help you unlock career opportunities in the different streams of Digital Marketing such as SEO, SEM and so on. 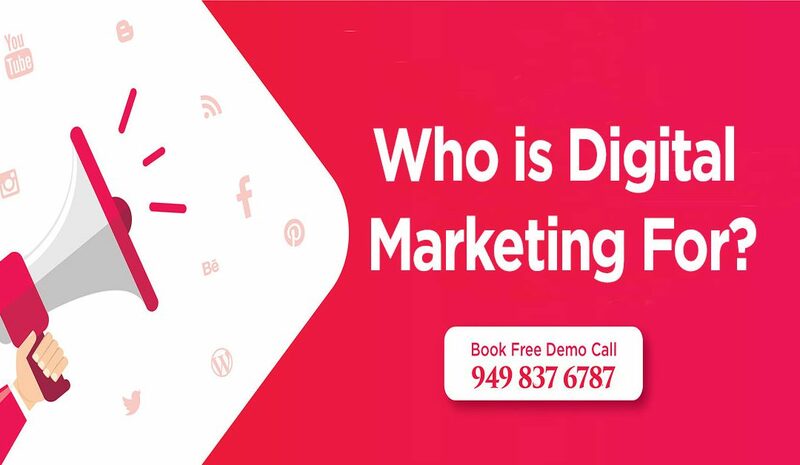 Professionals who are looking for a new career option in their life will definitely find immense value in digital marketing. We come across sales professionals who look at digital marketing to make a noteworthy switch. Whichever stream of work you belong to, digital marketing offers you huge value. Business owners usually prefer learning digital marketing because they can reduce the costs of employing marketing professionals. Moreover, since most of the customers are available in the online space, digital marketing can make a valuable contribution. We, at Aorta, offer digital marketing services to companies and digital marketing training to students. To enroll to our digital marketing training in Chennai program, give us a call. We will schedule a demo session at your convenience and explain you about our digital marketing course in Chennai. Since we are digital marketing professionals, we know exactly how the industry trends are.